Trademarks are signs used by a business or trade to distinguish their goods or services from those of other players in the market. Trademark signs protect your unique brands, words, logos, letters, names, signatures, numerals, devices, brands, headings, labels, tickets, shapes, colours, aspects of packaging or a combination of these in relation to your goods or services. For instance, the sports giant Nike’s Trademarks are the phrase “Just Do It”, and the swoosh (tick sign) logo. It is a form of Quality Assurance to your customers and clients, sending a message to them that you take pride in your business and all the work you have invested in it. Gives you absolute rights to enable you and your business to control the use of that Trade Marked sign for distinguishing purposes; otherwise the only way is for you to go to court to rectify any imitation and/or infringement of your brand or good name. You can prevent another party from using your distinguishing product or service, and from benefiting economically from the goodwill and market value that you have spent time and money to build up over time. Any claims you make against any infringing party that uses your Trade Mark without your permission may be enforced beyond Singapore, for instance in 83 countries that are signatories to the Nice Convention or if further filed through the Madrid Protocol System. This means that you may be able to stop infringing parties in these other countries from using your Trade Mark (via an injunction), seek an account of profits or even seek damages from that party for such an unauthorised use. For us to file a Trade Mark on your behalf, we will need to apply, and then obtain a filing date. A registered Trade Mark has to be capable of being represented graphically, and it is good to substantiate by some evidence of goodwill attached to your company/business as a result of using that Trade Mark, prior to registration. For marks comprising of a three-dimensional shape of the goods or packaging, this may be represented by line drawings. If a single-view line drawing is insufficient, multiple aspect views but up to a maximum of six views should be provided. For marks with non-English words and/or non-Roman characters, the English translation and/or transliteration (i.e. pronunciation) must be given in the application. Before filing an application for registration, we will first conduct a search of the existing trade marks records, to ensure that there is no prior trade mark that is identical or similar to the one you intend to use, particularly in the area of your business. Upon filing an application, we will obtain a filing date and the application should be processed and examined within 1-2 months of the filing date. The Registry of Trade Marks would conduct a formalities examination upon receipt of the application and fees. 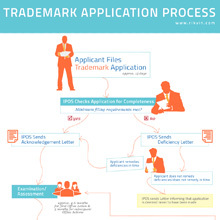 This entails a check that the application contains the minimum required information and the fee paid, whereupon a trade mark number and a filing date will be allocated. The application is also checked if it is made in the prescribed form and that the classification of goods and services has been indicated. After the application has passed the formalities examination, the Trade Mark Examiners in the Registry of Trade Marks will conduct a search to see if the mark applied for looks or sounds the same as any other trade mark which is already registered or has already been applied for by someone else for the same or similar goods or services. The examiners will also search to see if the mark consists of or contains a geographical name. In the case of pharmaceutical products, the Registry of Trade Marks will also need to check whether the mark consists of a protected International Non-Proprietary Name (INN). The INNs, furnished by the World Health Organization, are generic names for specific pharmaceutical substances. All of the above may give rise to grounds for objections raised against the trade mark application.In addition, the specification of goods or services will be checked to ensure that it conforms to the International Classification of Goods and Services. A wrong classification will result in the application being rejected by the Registrar and a fresh application may have to be filed. From the applicant’s perspective, a wrong classification may result in the applicant’s mark not being asserted in priority vis-à-vis later applications. After the searches have been conducted, the application will be examined to determine whether the mark is registrable in accordance with the law. The examiner will check to ensure that the mark does not fall into the areas not allowed by law, for example, marks that are devoid of any distinctive character.If the examiners have any objections to the mark, they will inform the applicant of their objections, and grant the applicant a specified period of time in which to overcome the objection. The applicant may also request for an extension of time in which to answer such objections. Once the objections have been overcome, or if there are no objections, the applicant will be informed of the acceptance of the application for registration and the acceptance will be published for public information in the Trade Marks Journal. Any interested party may oppose the registration of the mark within two months of the publication. Opposition is the process whereby members of the public, or any interested third party may object to the grant of a trade mark registration if they have valid grounds for doing so. The grounds of opposition may include issues such as the application is similar to a registered or pending mark, and so forth.Once a notice of objection is received, the applicant must respond with a counter-statement to resolve the objection. Both the applicant and opponent must supply evidence to support their respective case. The parties will then appear before the Registrar or the appointed representative from the Registry of Trade Marks, whereupon a decision on the application will be made after hearing both parties. After the hearing, the Registrar will give the grounds of decision based on the information and evidence presented by both parties. If the opposition to the registration is resolved in favour of the applicant, or if there are no opposition, the trade mark will be registered and a registration certificate will be issued. *Source of information: Intellectual Property Office of Singapore. 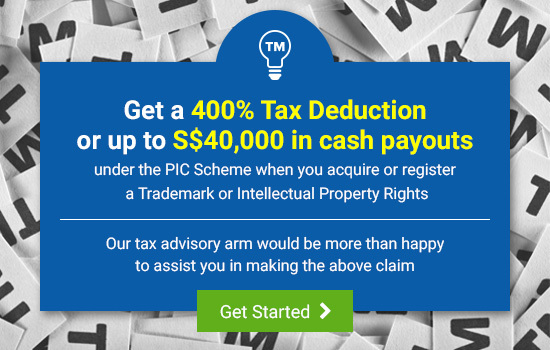 Claim up to 40% cash back or enjoy 400% tax deduction through the Productivity and Innovation Credit (PIC) scheme if you are a Singapore-incorporated company registering for a trademark - let our consultants walk you through the process.